Thank goodness the sun is out right, I for one love a rainy day but its good to see the sun is out! Since the sun has re-entered our lives I thought today’s activity should be something were we can enjoy this weather, so today, enjoy a meal and the view at the Oasis. 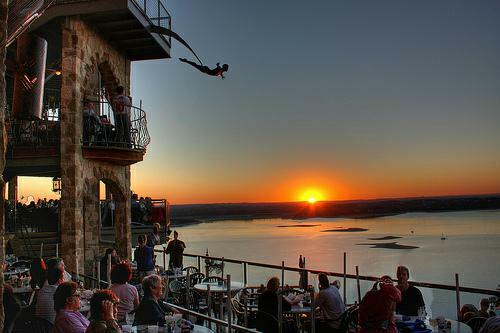 The Oasis offers truly breath taking views of Lake Travis all while enjoying an affordable menu with a variety of American and Tex Mex. Here is a little bit of history for those of you who do not know, in June 2005 lightening struck one of the decks, the fire burned 80% of the decks. Three days later they reopened to costumers and salvaged what deck space was remaining. They immediately began plans to rebuild and now bigger and better than ever, the Oasis can now seat up to 2,000! Get out and enjoy this weather, Happy Dining!